Guys, marketed health foods scare me. They scare me a whole lot. The words ‘gluten free’ from the mouths of anyone without Celiac disease make me shudder. And don’t even get my started on all of those other “x-free” products out there. The only thing free from those products is the truth! While crazed fools are all on tea detoxes, juice cleanses and the likes, I’m over here mournfully thinking about the large homemade tiramisu leftover in my office refrigerator that I walked right past on my way out. I fully support an occasionally overindulgence – full fats and limited processed foods (two cited weaknesses: sugary peanut butter and the half dozen hot dogs spread throughout the summer months). That being said, in general I’m a pretty healthful and healthy eater. My motto is a good blend of the traditional “all things in moderation” and EAT REAL FOOD when it comes to cooking at home. Ok. I’m done. I’ll get off my soapbox now. Last night, I prepared a salad to fulfill some of my fruits and veggies requirements. I don’t limit myself to boring tastes because we all know that’s how salads get boring real quick! Instead, I formulaically build my salads by mixing up my lettuces and greens (arugula, spinach, cabbage, radicchio, endive, frisee), veggies (infinite possibilities here), crunchy bits (seeds and nuts), sweets (mangoes, grapes, cherries, strawberries, citrus supremes, etc. ), fats (wheel cheeses, bacon, pancetta, prosciutto), and an optional protein if I feel my fats and crunchy bits don’t fill the protein quota for me. Generally, I dress my salad with an acid (sherry, red wine, or balsamic vinegar or a squeeze of citrus), extra virgin olive oil and salt and pepper. Easy right? The key is to keep the good stuff in the salad. For me, that stuff is the fats. You put a small enough amount in there, you have no choice but to eat everything else to score a gem of cheese or a crisp bite of pancetta. Preheat a frying pan over medium high heat. Cook the pancetta until crispy, turning once. Remove the pancetta and place on a paper towel lined plate to soak up the excess oil. 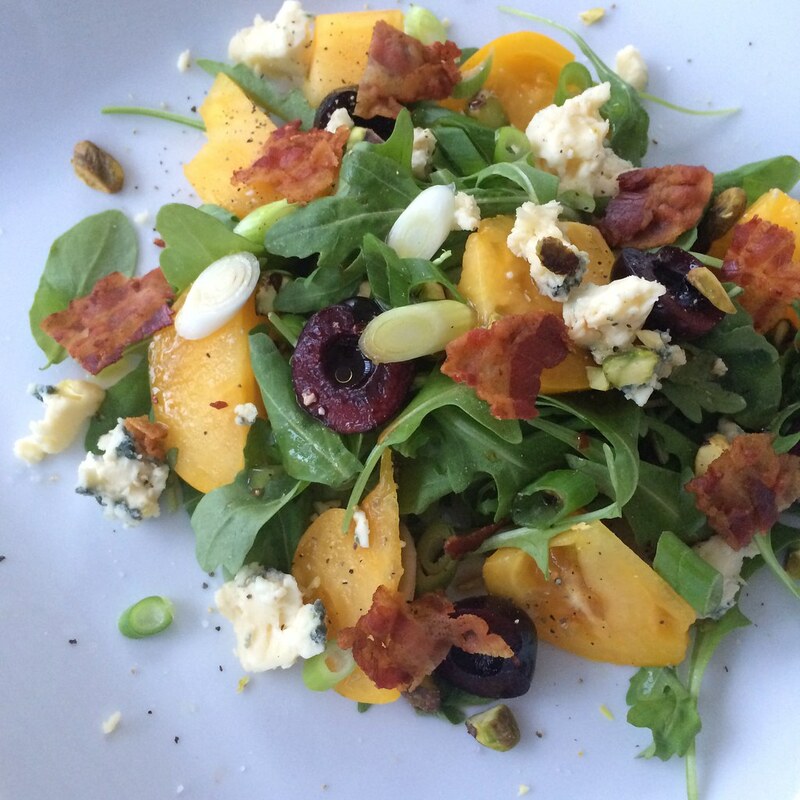 Assemble the arugula, tomato, cherries, blue cheese, pancetta, scallions, and blue cheese on your two serving plates. Salt and pepper to taste. Drizzle each salad with the sherry vinegar and EVOO equally. Serve immediately. Lean Cuisine might not thank you, but your taste buds and your body sure will.